Coll. No. 893, 24 Aug 2013, characters observed while keying: Perennial shrub, to 40 cm; Stem glabrous; Leaves alternate, 5 cm x 9 mm wide, oblanceolate, margins serrulate, margin teeth glandular; Inflorescence, head enclosed by involucre, flat-topped, not overtopped by leaves, heads with gummy exudate; Phyllaries in 4-6 series, unequal, eglandular, tips acute, coiled 360°; Receptacle epaleate; Flowers of 2 kinds, many; Pappus, few well-developed awns; Corolla yellow. Field Notes: Coll. No. 893. U. S. Highway 395: near Conway Summit. 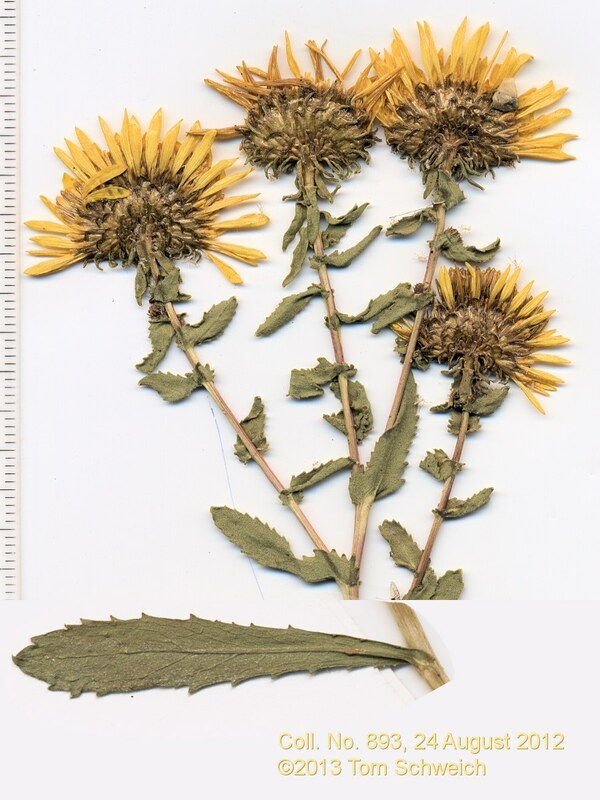 Other photos about Species - Asteraceae or Grindelia squarrosa serrulata.